I am pleased to announce that we are now accepting applications for the 11th Annual InnovAction Awards! Each year, the College of Law Practice Management conducts a world-wide search for lawyers, law firms, law departments and others in the legal services field that have invented or successfully applied new business practices to the delivery of legal services, and recognizes successful contributions with an InnovAction Award. The goal of the InnovAction Awards is to demonstrate to the legal community what can be created when dedicated professionals with big ideas and strong convictions are determined to make a difference. Any individual lawyer or law firm, practicing anywhere in the world, or any business providing services to lawyers, law firms or consumers are eligible. An individual lawyer or law firm may submit more than one entry so long as they are not duplicative. For additional information, go to the How to Enter page to learn more. The deadline for submitting an application is June 30, 2015. You can read about the winners here and browse the Hall of Fame to learn more about past Award recipients. 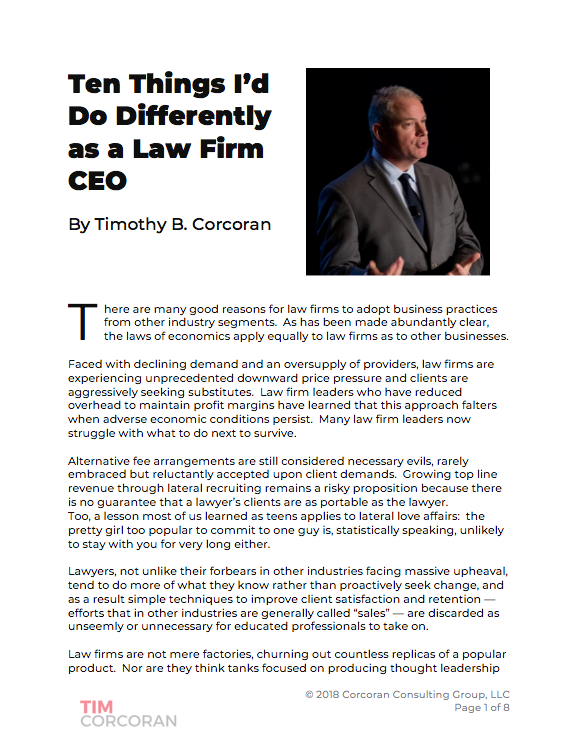 Timothy B. Corcoran is the Chair of the InnovAction Awards, the immediate past President of the Legal Marketing Association, and an elected Fellow of the College of Law Practice Management. He delivers keynote presentations, conducts workshops, and advises leaders of law firms, in-house legal departments, and legal service providers on how to profit in a time of great change. To inquire about his services, contact him at +1.609.557.7311 or at tim@corcoranconsultinggroup.com.